Waterloo Region was fortunate to already have a strong sense of community when an enthusiastic group began to meet and make plans for Children’s Mental Health Week (May 2-6, 2016). The group came together to demonstrate that agencies and school boards are collaborating in ways that support our whole community. This grew into a committee, named Wellness Works in Waterloo Region, whose members meet regularly to find ways to promote community mental health and well-being. This year, we began our effort with a decision that we needed to be visible at two different local malls on the weekends that bookend Children’s Mental Health Week. 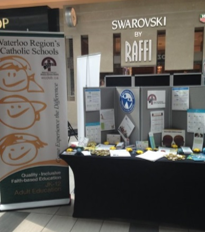 We set up more than 10 informative booths at each mall, with representation from multiple school boards, our lead agency and other important resources. We appreciated the solidarity between school boards as well as the positive community response to our presence. In addition to the displays, committee members supported each other on social media by sharing consistent messages with resources, events and messages of well-being. Having a strong community network also fostered well-being in other ways. The committee provides local Mental Health Leads an opportunity to share developments in each school board, which enables us to align efforts where possible. Our next step is to create a mental health and well-being poster campaign; we expect this to provide consistent messaging to local school boards and community agencies. Several student focus groups have already given us valuable input about what the posters should contain and where they should be located. This fits with our committee’s clear goal to provide information that is the consistent regardless of where students live and what school they attend.